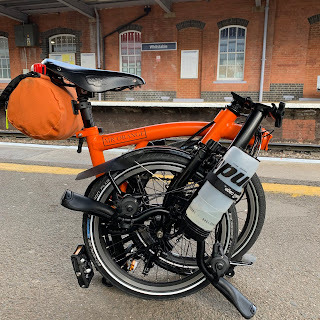 My Orange Brompton: ONE MILLION Page Views...Thank you! At some point in the early hours of 25/02/16 my humble blog passed one million page views. This is something I knew was imminent and the fact I have now passed this mark makes me rather happy. I could have passed the one million mark some time ago but as many of you know I drastically cut down the number of blog posts I put out there from the second half of 2015. Some of you have been there from the very start. Some of you have only started following me recently. Many of you have even gone on to buy your very own Brompton bikes. This blog was started as an online diary so that I could look back now and then at all the adventures I have got up to. When I look back at some of the rides I have participated in I can hardly believe it happened but the evidence is there in this blog. Quite often I mention a few names in my blog posts and you will see that there are a few that crop up quite often. It is partly because of them that I often have something to write about or photograph! It is only proper that I take the time write about a few of these people. There are many I could mention but I would have to start with my Partner in Crime, Andrew, who as you know has his own excellent blog. We almost started our respective Brompton adventures at the same time and has become a valued friend. David has been the leader, organiser and pace setter for countless adventures and without him leading so many rides I would have had a great deal less to blog about. Along with his partner, Anne we have been on countless adventures and again have become valued friends. Geoff, Mark and Dr John are true gentlemen. I have been on countless nocturnal rides with Mark and Geoff and always enjoy their company and the pleasure of friendship initiated again by the shared interest of cycling and a certain folding bicycle. Bob, a wonderful character is a formidable cyclist and seems to know just about everyone in the Brompton scene. It was via Bob that I heard about the night rides to the coast that I have come to enjoy so much. There are many more wonderful people I could mention but this would go on for ages. Last but by no means least is you out there. Thank you for reading and continuing to read my efforts and for many of you to take the time to contact me. I only hope that I continue to keep you amused and that you might use my example to go out on your own adventures. The very kind people at Brompton have kindly donated something that you the reader can win. As yet I do not know what it will be. Please do not expect it to be a Brompton bicycle! Whatever it is, it will be directly from Brompton HQ and that alone is special enough. So keep reading my blog to find out what it is and how you can win it. Been a pleasure and a privilege sharing your adventures! Genuine best wishes to you, your family and all your fellow LBC buddies. I have a Brompton myself now and although I may never meet you or Bumblebee, your blogs and videos along with Bumblebees' (New Forest!) caused me to buy my Brommie, and through this little bicycle I've rediscovered the joy in life again, so God Bless Andrew Ritchie too! It does not matter what will be donated by Brompton. I am here day by day to read your stories, tests and it seems to me now this is the time to say: Thank you!